This entry was posted in Otaku, Personal. Bookmark the permalink. 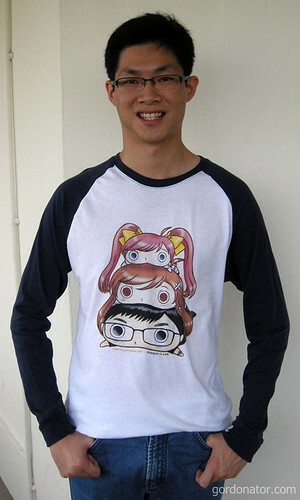 I love anime/manga but I’m just not willing to wear a shirt that has to do with my hobbies. Although I have no problems covering my notebooks in anime images. That Image still scares me to the bones…. @TK-8316: One cure for shyness~ Wear the helmet, my friend, the helmet. Suspicious number 2 so this shy person when I feature his image he won’t mind? lol was it so long he has to tuck in? Very nice clear picture lol! I hope I’ll be able to get one of these shirts for myself soon. I see the face of a leader. lol. tare panda is like that. he said he is ok with it. didn’t tuck in, just folded up. do get one, the shipping is fast, within a week. lol that’s too flattering. i’ll tell him that. then u know what u must do. Looks cool.. So did your friend wear it for the whole day?? Looking good on y… him there, Gordon! haha I see we share the same camera shy problem with ourselves ^^; ironically, we love taking photos of everything else xD. The good thing is 100% cotton.. When I saw the pic, I blinked. I almost thought I forgot your face, then I realised it wasn’t you. never really pay attention to that. check out danny’s post and chun’s web for more info.